Feel the magic of the Jewel Riders! 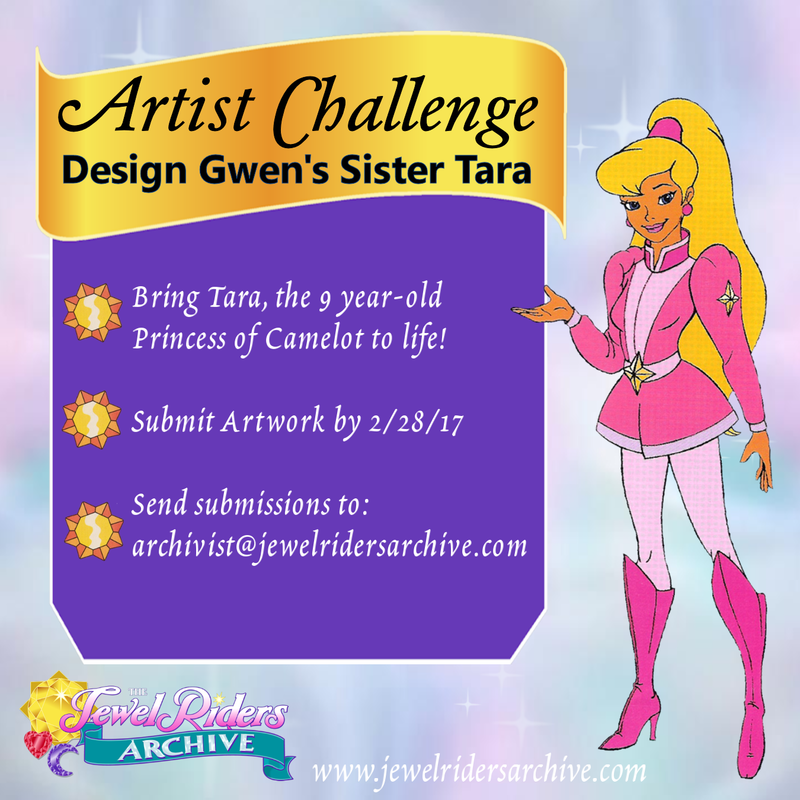 Hey Jewel Fans, welcome to the Jewel Riders Archive's first Artist Challenge! There are so many fun ideas floating around in the background material for the show, and we began to wonder if our talented fandom might be able to bring some of them to life! Younger sister to Gwenevere. Can't wait to get her Enchanted Jewel. Manages to get into plenty of trouble with Melody's baby animals. Tara is Gwenevere's younger sister. She loves the performing arts, especially dancing and singing. She also loves craft fairs and babysitting for Melody's baby animals. Somehow though, whenever Tara and the babies get together, trouble follows. One day Tara will have her own Enchanted Jewel, then look out world! All the above information is from the Enchanted Jewel Riders Show Bible. Submissions will be open until 2/28/17. Submit your work to the Archivist Email. Voting will happen between 3/1/17 and 3/9/17. The winning design will be announced on 3/10/17. Disclaimer: Submissions must not contain anything violent or offensive in nature. Posts may not compromise the character’s integrity. In connection with anything you submit to us – whether or not solicited by us – you agree that creative ideas, suggestions or other materials are okay to be featured on the site but do not constitute a contract of any kind. You retain full ownership of your work; think of the Archive simply as a gallery to display and share it. Tomorrow we'll be updating the site with tons of new great material, including the storyboard to Jewel Quest Part One, the script to "Morgana," (kicking off our monthly releases of S2 scripts), and the first of our episodes with the "Princess Gwenevere" audio track! I wanted to give you all a heads up that I am beginning to sell my collection of Jewel Riders toys on ebay (username: randidalton). If you are looking to start collecting or completing your collection, keep a lookout for my listings! P.S. If anyone has any of the Princess Gwenevere Binders or Folders, or the Lunchbox/Thermos set, please let me know if you'd like to negotiate a trade! So every week I challenge a few of my friends with a word prompt and a fandom. This week, I've made the prompt fandom to be JR, and I figured I'd see if any of you wanted or needed an excuse to write something out. It's free reign really, as long as you have the prompt word in there some how, in any of it's definitions you're golden. It can be as long or as short as you want. Anyways, if you're interested. The prompt is Branch. Post your stories in the comments if you do end up writing something. So I finally got organized. Just a few because the rest are being emailed to JRA so they can display them on their webpage. And honestly I'm hoping these share here since I don't think I have a hosting sight anymore. Question regarding the archive's jewel section! So, I noticed under the Wizard Jewels there was a section called "Wild Jewels" - anyone know what those are? Stay tuned to The Jewel Riders Archive! Also, don't forget to sign up for our Circle of Friends and get a present on your birthday from the Archive! It's hard to believe that TEN YEARS AGO today Lisa founded this Jewel Riders community, and we're still going strong! Over at The Jewel Riders Archive, we wanted to commemorate this milestone anniversary and reached out to Lisa to share some fandom memories. Ten years ago, the big news was Digivew releasing their single DVD, sharing fun LJ icons, uploads of the series soundtrack, sharing of links to various Jewel Riders-themed websites, and even a petition to bring the show back on the air! This coner of the internet has been my fandom home for Jewel Riders, and I am so grateful for a space to connect and share with other fans. Thanks for ten magical years!